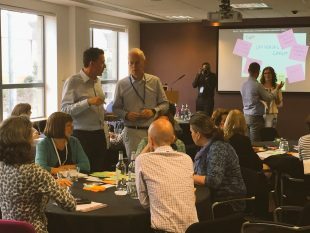 It was a real pleasure to host the third Transforming Together event in Edinburgh on 20 July. The transformation community turned out in larger numbers than ever before, and with increasing focus on collaborative action. 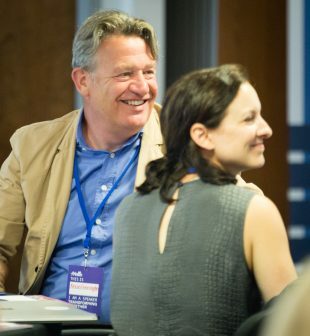 The day was ably compered by Colin Cook, Digital Directorate at the Scottish Government, and Lara Sampson, DWP, with an inspirational keynote delivered by Holly Ellis from the Home Office. Particular thanks to Kevin Cunnington, DWP, the father of the Transforming Together community, who broke his holiday in Norfolk to be there. This Storify gives a brilliant summary of the day. There will be a follow up work on all these issues, which will report back to the next Transforming Together event on 19 October in London. I also gave a short talk, mainly about what's happening in Scotland. Coming from a policy background, I emphasised the importance of building an inclusive transformation community, making it easier for policy professionals to make the first parachute jump into transformation. My starting point was that Scotland is of a scale - we can get the leaders of all public sector bodies in a single room! It has a strong collaborative ethos that allows us to think about transformation across the whole public sector, rather than just in central government. Our Digital Public Services Strategy is a public sector strategy, to which all parts of the public sector, including local government, are signed up. Relentless: collaboration is hard and has to be worked at, building trust, aligning perspectives, dealing with unexpected disruptive events while keeping our eyes fixed on the shared outcomes. 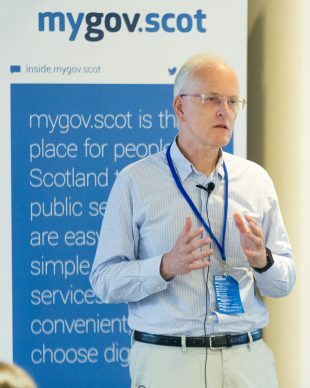 Developing a digital public services ecosystem in Scotland, much in line with the work on Government as a Platform. We are working initially on information sharing (starting with evidence in the criminal justice system), grants and licensing, data hosting, and, as we take on new powers, social security. We are keen to hear from others working in these areas. The Digital Transformation Service which has been created to support Scottish Government and the rest of central government to build their transformation strategies, and to scope and resource the projects to deliver it. The DTS works on a cost recovery basis. The developing Scottish Approach to Service Design, which was also the theme of Cat Macaulay’s breakout session. Her slides are here. Finally, and not strictly speaking digital transformation, I talked a bit about the CivTech initiative which is intended to get start-ups and SMEs working to solve public policy problems, by using an accelerator type model, and providing the incentive of potentially profitable products as the output. See you in London on 19 October!